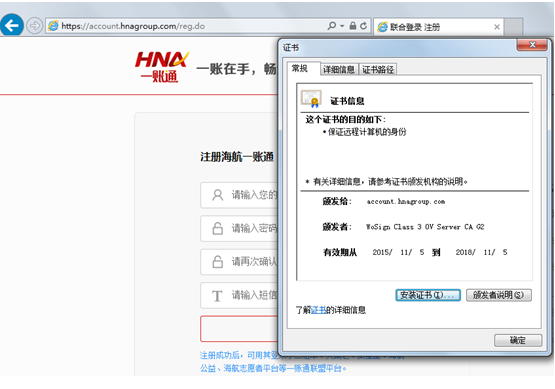 HNA One-Account Pass enabled WoSign OV ZhenSSL certificate-WoSign SSL Certificates! Recently, the One-Account Pass platform of Hainan Airlines Group has successfully enabled WoSign OV ZhenSSL certificate to secure the account information and privacy of the platform’s users. After 20 years of development, Hainan Airlines Group has grown from a single local air transport business into a large multinational group, whose subordinates cover multiple fields like HNA air transport, HNA financial industry, HNA tourism industry and HNA hotel group. One-Account Pass is the unified sign-on platform established for the convenience of users by HNA group. The account number of this platform can be used to log in multiple business platforms of HNA group. Users can manage several accounts and enjoy various products and services of HNA with only one account number being logged in. Logging in one account that can be used in multiple platforms provides the subscribers a convenient user experience. But it also has high requirements of platform security. The One-Account Pass of HNA covers multiple business platforms that involve lots of confidential information of users, including renter information, financial information, bank account information, personal identity information and family address. Once this account is disclosed, users’ private information and property security will be threatened. The One-Account Pass of HNA applies multiple security mechanism, among which the HTTPS transmission encryption is the most important and fundamental one. After strict screening and testing of domestic mainstream SSL certificates, HNA One-Account Pass platform chose WoSign OV ZhenSSL certificate to provide security services for it. The project leader said that WoSign SSL certificate has shown distinct advantage after the comparison to several brands. WoSign certificate supports all browsers and mobile devices as other certificates, but it also supports Chinese language. The most important point is that WoSign provides official 7×24 hours localized services for users include one-to-one customer service in the pre-sale phase and one-to-one technical support in the after-sale phase, which can ensure the certificate is properly installed and safely used. Unified login platform relieves people from plenty of account numbers and passwords. However, it also brings potential security risks. WoSign CA (www.wosign.com) hopes more and more enterprises can deploy SSL certificates for their login page just like HNA One-Account Pass and Inspur GSP+ unified access center to secure the transmission of users’ and enterprises’ confidential information.